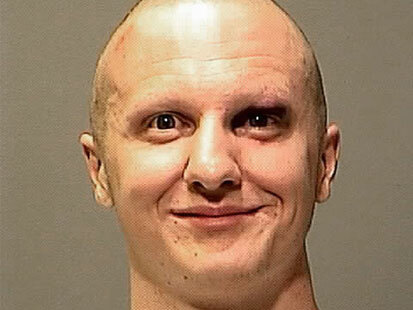 Today, deranged gunman Jared Loughner appeared in federal court for the first time since the Arizona Sageway massacre where 6 people were murdered and numerous others injured including US Rep Gabby Giffords. As if this loner screw ball was not deranged enough, he appeared in court today with a shaved head as was reported that he smirked during the proceedings. The charges are one count of attempted assassination of a member of Congress, two counts of killing an employee of the federal government, and two counts of attempting to kill federal employees. “Yes, I am Jared Lee Loughner,” said Loughner, with a freshly shaved head, when the Judge Lawrence Anderson asked him to confirm his identity. Loughner, with a fresh bruise on the side of his head, leaned forward to look at the paper and responded, “”Yes I signed it. Mrs. Clarke did help me out.” Mrs. Clarke refers to his court appointed public defender, Judy Clarke. A note to the loony LEFT and the MSM … Jared Loughner was a registered Independent and never voted in the 2010 midterm elections. In one of the most contested elections, especially for conservatives and the Tea Party, Loughner never even bothered to vote. As Powerline stated, “Obviously he was too riled up by Sarah Palin and the Tea Party movement to make it to the polls.” Hey LEFT, want to retract your statements that he had any connection with Sarah Palin Glenn Beck, Rush Limbaugh or the Tea Party? How pathetic that this would be your first reaction to such a terrible event. Even more pathetic that you are upset that this deranged lunatic was not a member of the Tea Party. Note to Left, Loughner is not the only one who needs mental help. Loughner registered to vote on Sept. 29, 2006, identifying himself as an independent. Records show he voted in the 2006 and 2008 elections but is current listed as “inactive” on the state’s voter roles — meaning that he did not vote in November. Is Jared Loughner Going toto Plead Guilty in Tucson Massacre Shooting? Is that from today? It looks like he shaved his eyebrows too. That face has insane written all over it. This murderer has been sick a very long time. I would be willing to bet that this behavior began to show as early as twelve or thirteen years of age. Because of our freedom of speech and behavior, the public is at the mercy of crazed individuals such as this one. Our communities need to find ways of identifying and placing these individuals in a protective environment so they are not able to commit such crimes as this. Okay, by lefty logic this dispicable act was the result of not enforcing the immigration law. This guy will be killed in prison. He killed a 9 year old girl…that won’t sit well with lifers who have children…either that or he will be someone’s beyotch! This dude is a wack job and for the left to attack Sarah Palin over this is utterly ridiculous and WITHOUT merit. This dude has been planning this since 2007…BEFORE this so called map. Geez…I wonder if anybody else on that map has been shot and killed? NOPE. Bill O’Reilly said it best…this guy is just plain and simple a NUT JOB! He used the example of Andrew Jackson being shot; the guy who shot Jackson was just a plain and simple LOON BIRD! The left knows their “dream” society is OUT OF REACH. The MAJORITY of the American people see this; those with common sense and logic; and dismiss these liberal pukes! In Arizona it’s gas or lethal injection. I vote gas. this guy’s head and face look swollen, like he’s been on prednisone for a long time. i suspect he’ll lose that smile shortly for life. Laughner was an Independent? Good, that backs up his Teabagger affiliation. According to Rasmussen, 50 percent of independents identified with Tea Partiers. @#9 I see you have a problem with reading comprehension. Jared Loughner is in no way connected to “The Tea Party” or Sarah Palin or Conservative talk radio. Repeating the same lies over and over does not make them anymore true. I know it’s tough for liberals to accept the truth but there is not one shred of evidence that links him to the “Tea Party” so go spew your lies & hatred somewhere else, we’re not buying it.